When some friends called to ask if I could guide them around Zion during their cross-country road trip, I was eager to take on the responsibility of facilitating an unforgettable adventure for them. I was, however, unwilling to take them on a congested hike overfilled with tourists like “The Narrows Bottom-Up” or “Observation Point” can sometimes be. Those hikes, although I love them, can be characterized by the rubber-necking day hikers, and it’s nice to get away from them every now and then. Ideally, my friends would experience the “road less traveled” and really put effort into creating their own adventure. One of the most exciting activities to engage in at Zion is Canyoneering. Canyoneering is the sport of exploring canyons using a variety of techniques that include hiking, scrambling, bouldering, rock climbing, route finding, swimming, and rappelling – mostly into the water. There were a number of places we could have gone Canyoneering in Zion, but ultimately, I decided on Orderville Canyon Top Down. To be frank, it was the only permit that we could attain from the wilderness office for 7 people- but we were extremely lucky to have chosen it! Orderville Canyon is utterly incredible! It consists of 11 miles of slot canyons that leads down into The Narrows, which, in my opinion, Is a much better and more stunning hike than its big brother The Narrows Top-Down. Unlike The Narrows Top-Down, Orderville Canyon does require some technical canyoneering skills. It has two short rappels, several route findings, and some scrambling thrown in for good measure. Orderville Canyon, at times, can resemble a water park more than a hike. There is a significant stretch in which, after you finish the two rappels, you have to downclimb slippery waterfalls, traverse several log jams, and swim across deep pools. What makes it a cooperative, challenging activity is trying to figure out, as a team, how to descend down certain obstacles. At one point, we all had to free climb a colossal boulder and build a zip-line for our bags to make it over a large deep pool and onto dry land. This trip forced us to work as a unit. For a few of them, who began the trip as strangers, a friendship was formed in that manner in which only an adventure can forge. The breathtaking views and challenges of this hike are something you’ll remember for the rest of your life. It is well worth the effort and determination needed to complete it. Get shuttled to the trailhead; avoid driving yourself at all costs. Buy your buddy a six pack for a ride up the 11.5 mile trip through North Fork Rd or hire an expert guiding service like Zion Guru. Bring a short static rope. The rappels are only 20 ft or so, so bringing a heavy 70-meter rope is not necessary. 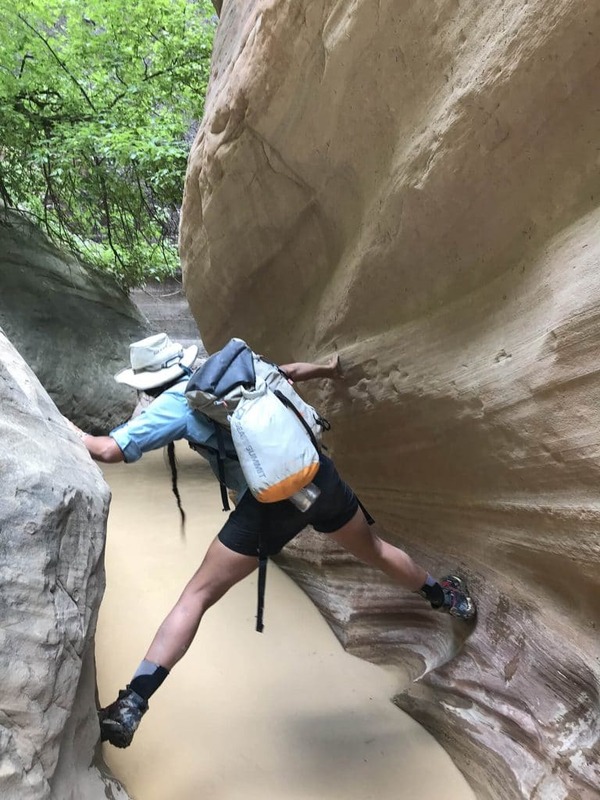 Rent canyoneering boots if you don’t own a pair! One of the hikers in our group wore his old army issue jungle boots and ended up having a blister the size of a baseball on the bottom of his foot by the time we made it to the shuttles. Don’t compromise in this department. Zion Outfitter offers top of the line canyoneering boots for rent. Pack a dry bag for electronics. Your packs will get wet! Don’t go if there’s any chance of rain. These slot canyons are narrower than the actual Narrows. You don’t want to get caught out here in the rain. Start early; you don’t want to miss that last shuttle down from The Temple of Sinawava (the last shuttle departs at 9:15 pm). Download the Zion National Park Wilderness Guide. Go to citrusmilo.com and read all about Orderville Canyon to get beta (climbing term for Intel) and see step by step pictures of the hike.